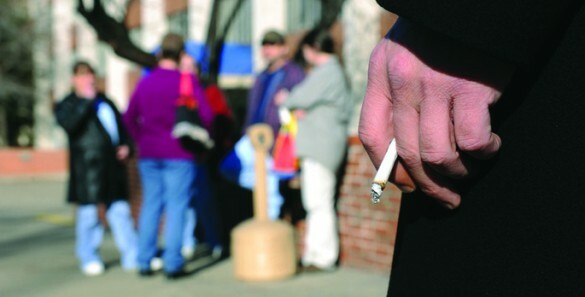 It is the first large-scale clinical trial to examine the effects of reduced-nicotine cigarettes on smoking behavior and exposure to products contained within cigarette smoke, according to study co-investigator Hilary Tindle, M.D., MPH, associate professor of Medicine and founding director of the Vanderbilt Center for Tobacco, Addiction and Lifestyle (ViTAL). The clinical trial was conducted between June 2013 and July 2014 at 10 sites, with subjects 18 years or older who smoked five or more cigarettes per day and had no current interest in quitting smoking. Participants were randomly assigned to smoke either their usual brand of cigarettes or one of six types of investigational cigarettes with nicotine content ranging from 15.8 mg per gram of tobacco (typical of commercial brands) down to 0.4 mg per gram. A total of 840 participants underwent randomization, and 780 completed the six-week study. During week six, the average number of cigarettes smoked per day was lower for participants randomly assigned to cigarettes containing 2.4, 1.3, or 0.4 mg of nicotine per gram of tobacco (who smoked 16.5, 16.3, and 14.9 cigarettes per day, respectively) than for participants randomly assigned to their usual brand or to cigarettes containing 15.8 mg per gram (who smoked 22.2 and 21.3 cigarettes per day, respectively). Participants assigned to cigarettes with 5.2 mg of nicotine per gram smoked an average of 20.8 cigarettes per day, which did not differ significantly from the average number among those who smoked control cigarettes. Thus it was only the lower nicotine cigarettes (less than 5.2 mg of nicotine per gram of tobacco) that produced the result of smoking fewer cigarettes per day. “The follow-up period was relatively short – six weeks – and the study was not statistically powered to measure clinical outcomes,” said Tindle, who served as the lead study physician while working at the University of Pittsburgh through the summer of 2014. Smoking is the leading cause of preventable morbidity and mortality in the U.S. and the world. Tindle said reduced-nicotine cigarettes may be a way to potentially lessen the harm that smokers experience from cigarettes by decreasing the number of cigarettes that they smoke per day or potentially playing a role in quitting smoking altogether. Under the 2009 Family Smoking Prevention and Tobacco Control Act, the FDA has the authority to reduce nicotine in cigarettes if it benefits public health. “If the FDA is to make such a determination, it requires evidence to support or refute the hypothesis that reduced-nicotine cigarettes are beneficial to public health,” Tindle said. Study authors said additional studies will examine whether it is better for smokers to reduce nicotine intake gradually or immediately and whether use of a transdermal nicotine patch in tandem with low-nicotine cigarettes further reduces cigarette use and dependence. The study was funded by the National Institute on Drug Abuse and the Food and Drug Administration Center for Tobacco Products; ClinicalTrials.gov number, NCT01681875.